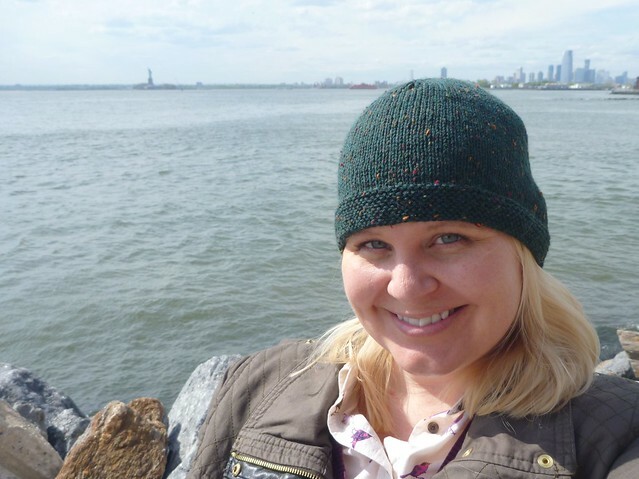 Vickilicious Knits – Page 2 – Art and science intersect with crafty obsession. This past spring I really enjoyed getting into charity knitting. Pattern: Improvised. My project page is here. I started this hat right after finishing the neckwarmer I made last April, and I worked on it at the first Knit Collective meeting. 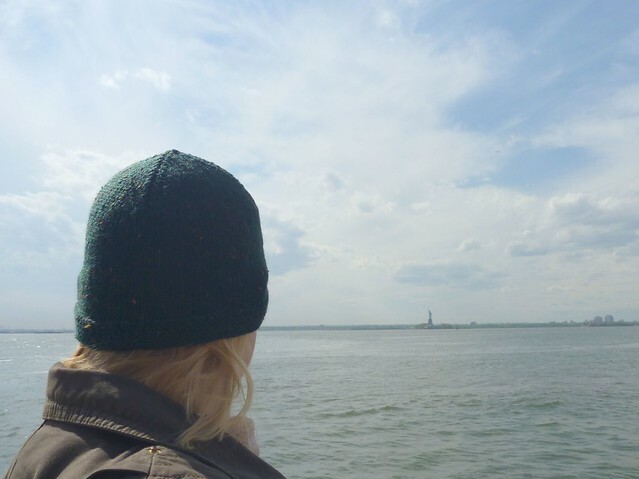 I finished it while overlooking the Statue of Liberty, which felt somehow fitting and symbolic for a gesture of solidarity and love for refugees. 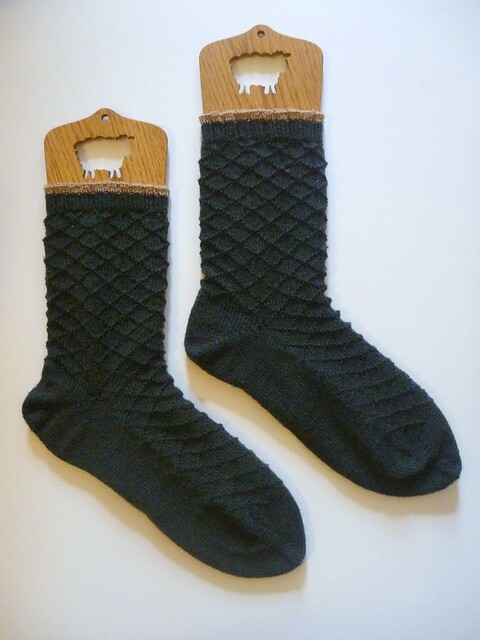 I kept within Knit Aid‘s requirements of dark, gender-neutral colors, but I thought it would be nice to use a soft, luxurious-feeling washable tweed. 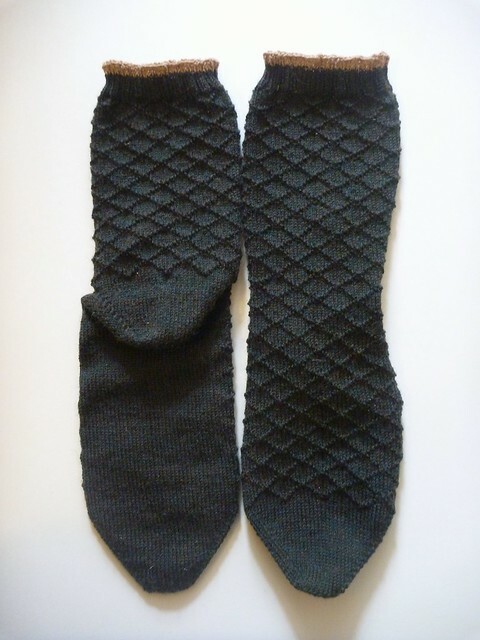 I had originally bought this yarn with the intent to make either slippers or gloves as a gift, so I knew it was squishy and nice against the skin. 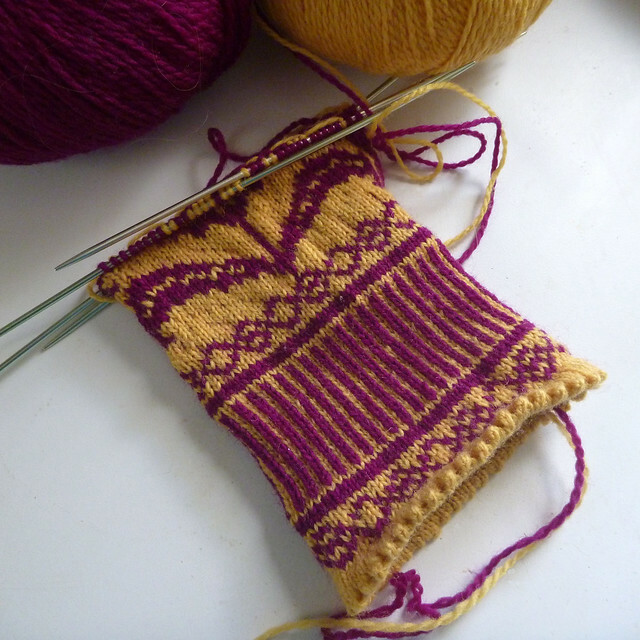 The pattern was improvised after working out the gauge and trying it on a few times to figure out where to start the decreases. I worked the crown in quadrants, which gave it a neat, tidy fit. I recently saw Ai Weiwei’s incredibly moving documentary Human Flow at a screening in Manhattan (trailer below). It was such a heartbreaking, profoundly emotional film that showed the refugee camps and the spirit of the people living in them at the scope and scale of crisis it truly is. I already felt strongly that I wanted to do something to help, but after seeing the stories and experiences shared in the film, I am more committed than ever to bringing some warmth and love to people’s lives. 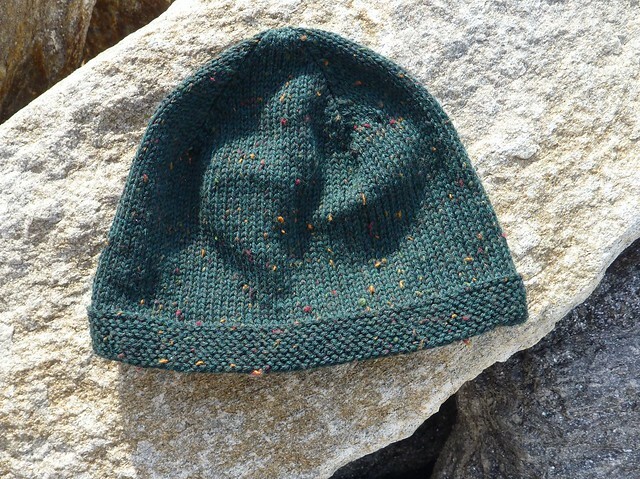 I donated this hat in May, and I hope that it has found an owner who it is warming and protecting by now, or that it will soon. 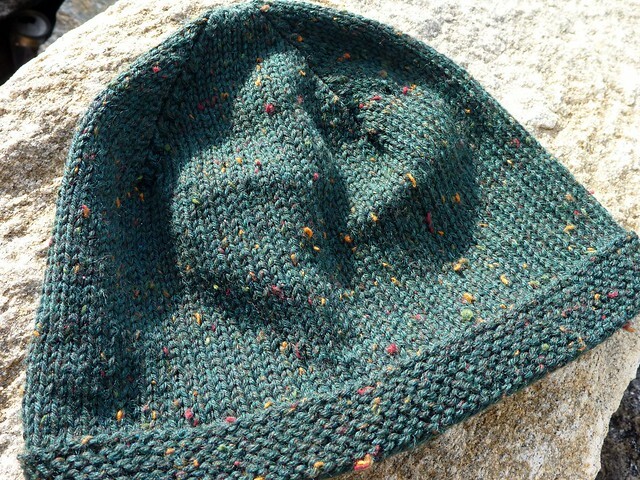 And I especially hope that whoever owns this hat will feel the love and concern that went into every stitch. As I started working on the Chrysanthemums mittens from Knitty, it occurred to me that chrysanthemums are the birth flower for November, so these would make an excellent birthday present to myself (November 1). In the first pass I made the background of the main section yellow and the chrysanthemums this purplish fuchsia, but it looked drab and I really disliked how much the strands in the back showed through with the tension issues I was having. 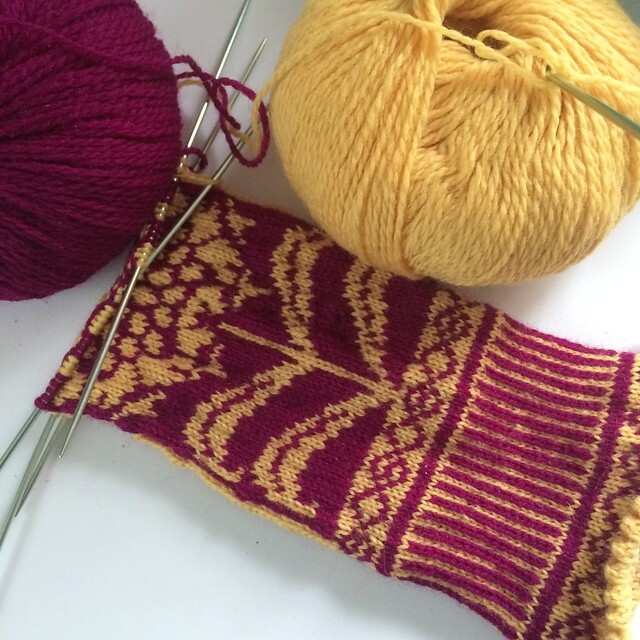 I also realized that if my intent is to (ultimately) have these mittens go with a Selbu Modern beret as planned, they wouldn’t coordinate well in reversed colors. I ripped back to the cuff but decided to keep the picot trim and wrist section with a yellow background for contrast. I’m much happier with the color combination now and excited to see how these come out! It’s funny how the universe puts things in your path right when you are looking for them. I’m not sure what prompted me to search for a knitting group on the day I did, but it happened I found a wonderful one that was just about to have its first meetup. 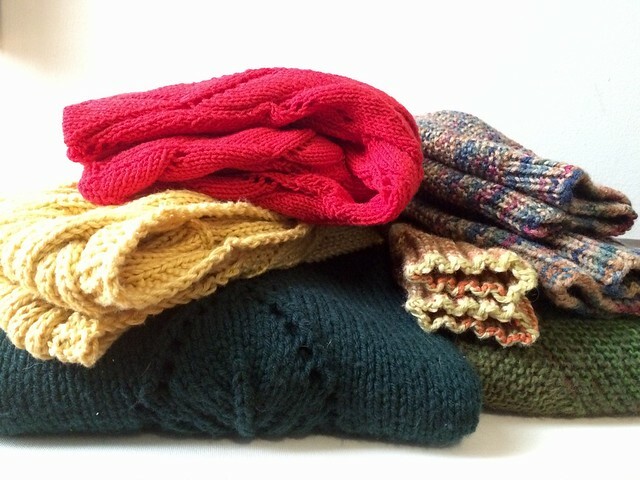 The Knit Collective is a new New York-based group that partners with established non-profits to donated hand-knitted items to those in need. 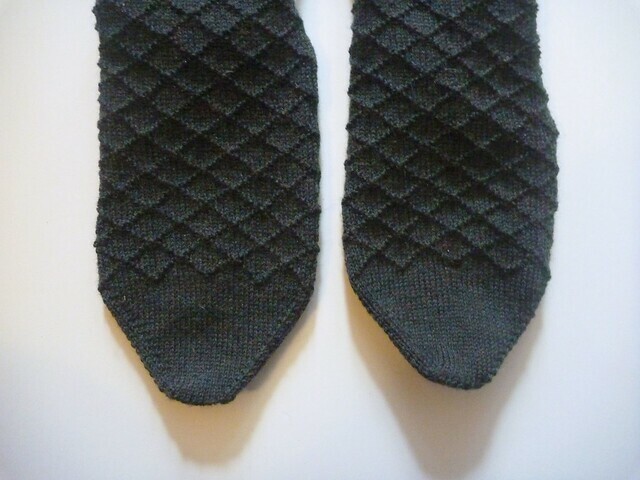 Pattern: based on Knit Aid’s Snood. My project page is here. 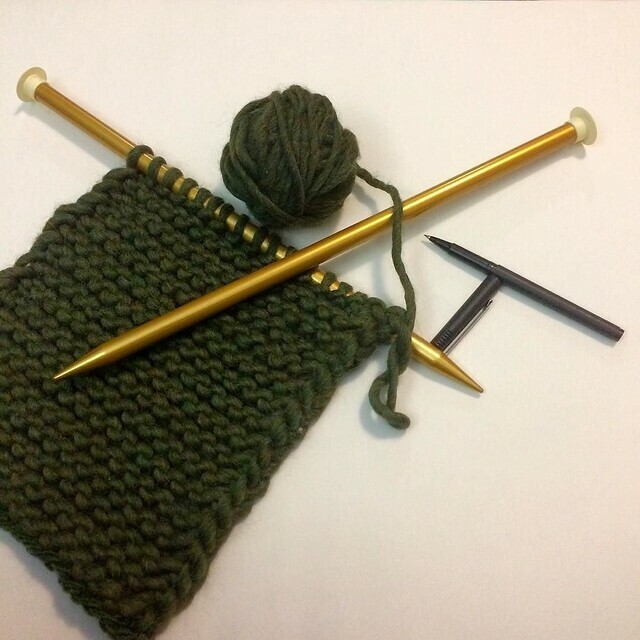 The first project is working with Knit Aid, an organization based out of the UK that is bringing hand-knit hats, gloves, neckwarmers, blankets, hot water bottle covers, and other warming items to refugees in camps. When I read about the conditions in these camps and imagine people in already tenuous and frightening situations shivering through the night in below-freezing temperatures, my heart can’t take it anymore. 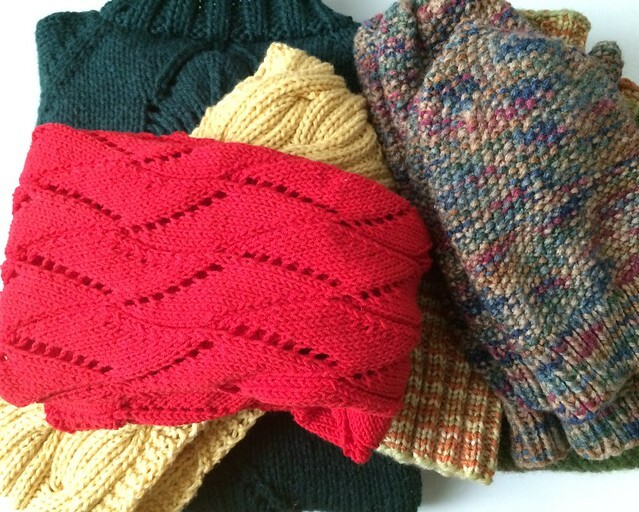 A hand-knit item is a small gesture, but an important thing. Taking the bitter edge off the cold so a person can sleep is huge for anyone, but I hope it gives extra comfort to those most in need to know other people in the world care about them and are trying to make their lives a little better. 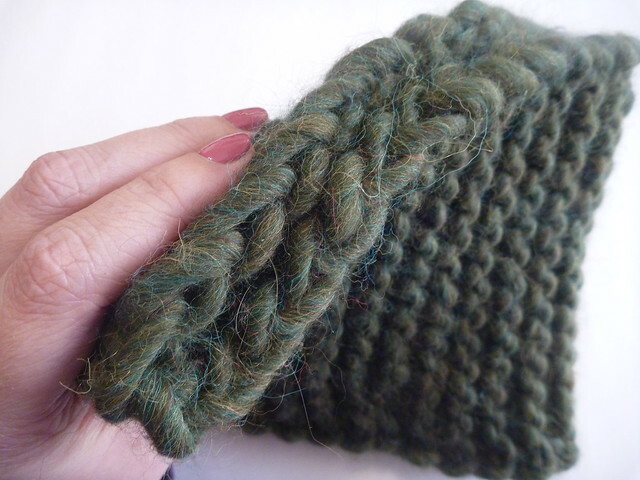 I had some squishy wool and alpaca super bulky yarn in my stash that I bought years ago to make a boyfriend a hat. 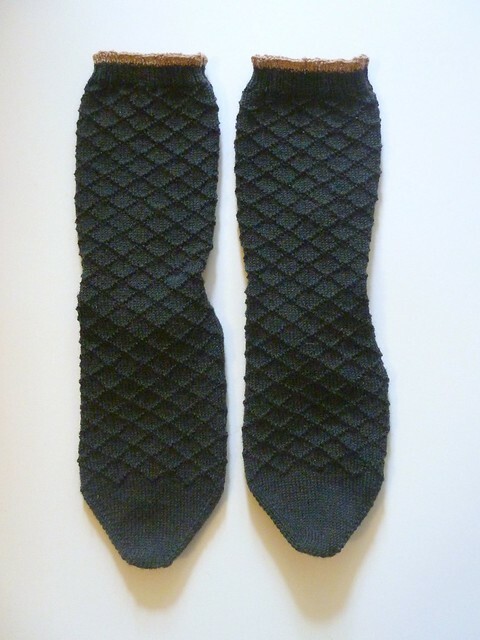 I was delighted it fit the criteria for fiber content and was suitably dark and gender-neutral to comply with Knit Aid’s requests. 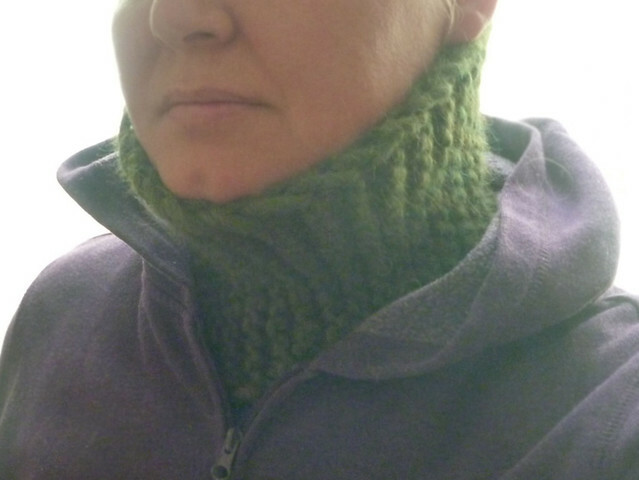 Though I based my neckwarmer, which for some reason they call a “snood,” on their pattern, I decided to use a provisional cast-on to eliminate a bulky seam at the back of the neck. 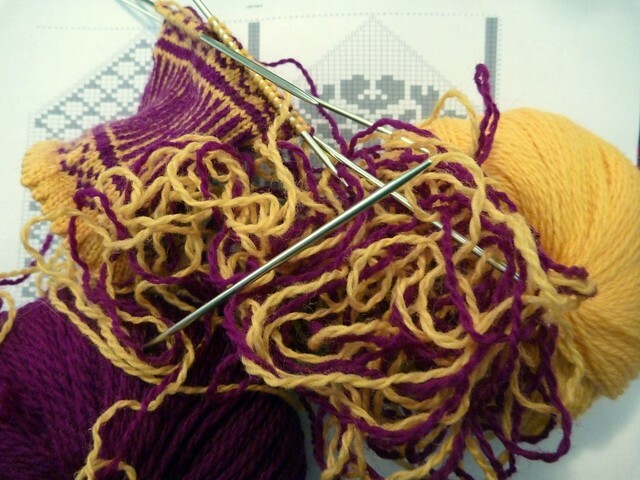 Working with size 17 needles, I joked, was like knitting prop comedy, and I was amazed at how quickly it took off. So quickly, in fact, that I had zero qualms about frogging the whole thing and starting over when my first version was too tall (chin to chest) and too tight, due to having slightly thicker yarn than the pattern called for and a bit less of it than would have been ideal. 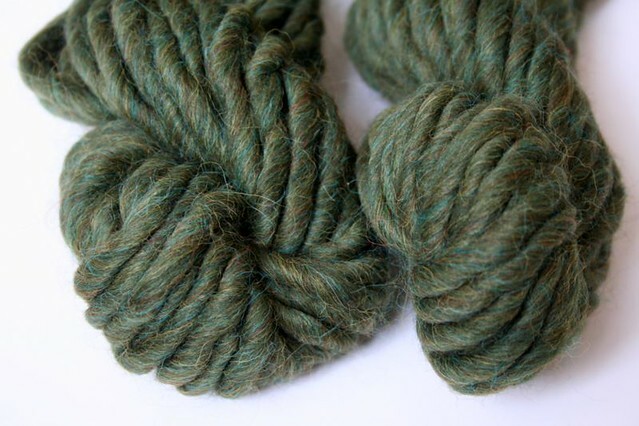 As lovely as Classic Elite Alaska is, I am mystified about why it was put up in measly 25 yard skeins. Most of the hats I saw (only after buying 2 skeins per color) used at least 3. I reduced the amount of stitches and ended up with a neckwarmer that is still snug, but can comfortably slide over my gigantic head. I expect it will be huge on a normal-sized woman or child. 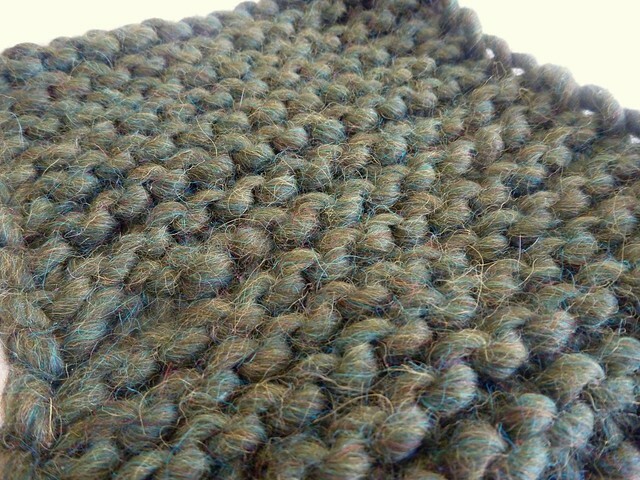 I slipped the edge stitches to give a braided look that should be soft where it touches the skin. 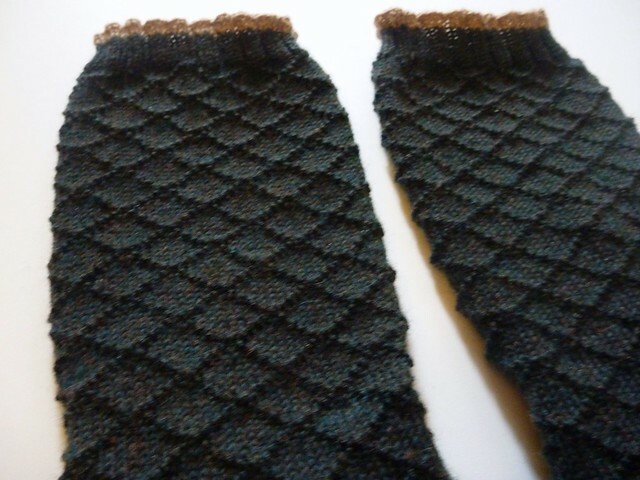 I grafted the last row to the cast-on edge to make a fairly seamless tube, which will be comfortable if worn lying down. 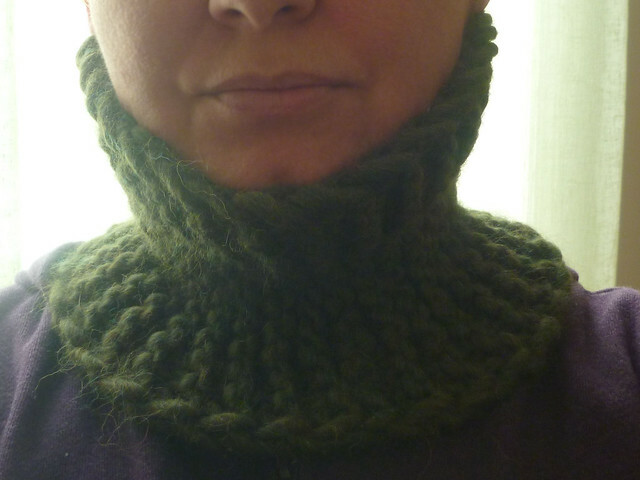 I was initially concerned that the snugness looked like a Victorian collar (also, please forgive the frowny and poorly-lit modeled shots – I was running late and rushing). Not that that’s a bad thing, but it’s not as unisex as I’d envisioned. When tucked into my hoodie, though, it just became a super warm base layer that could be pulled up to cover the lower face or over most of the head and neck if needed. 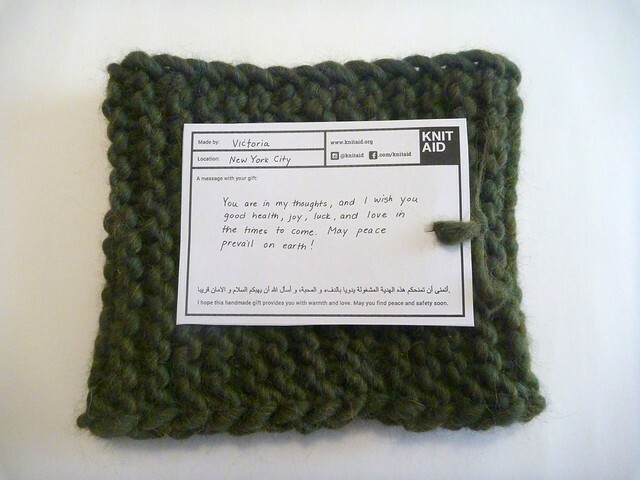 Knit Aid encourages you to write a message on their cards to include with your items, to communicate good wishes and let refugees know that people all over the world are thinking about them, praying for them, and putting their hands and hearts into this little gesture. (Of course, it is also important to contact your representatives and work at these issues on all fronts). 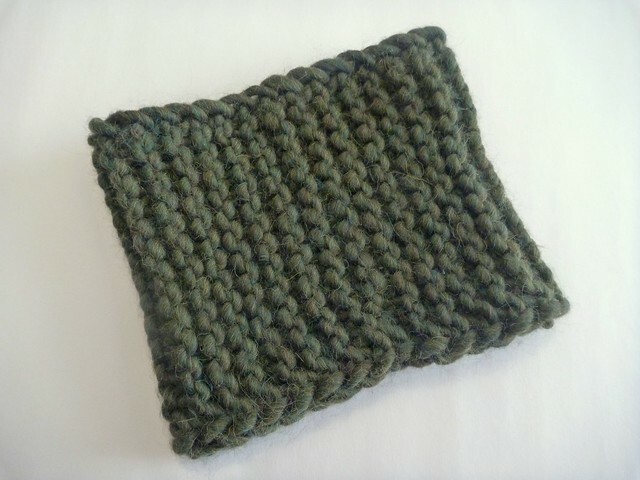 As I knit, I thought about the person who would receive this neckwarmer, and I hoped with all my heart it would give comfort, warmth, and love to someone who needs it. 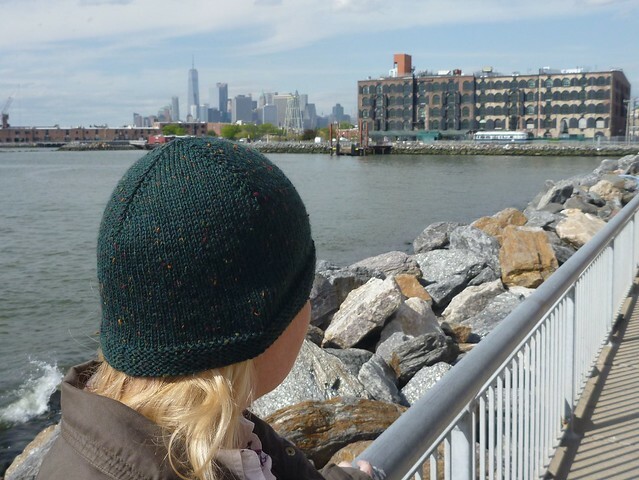 I am so happy to have found a group of like-minded, truly lovely knitters in the city, and I’m excited about upcoming plans for fundraisers and more knitting meetups. I have long been afflicted with startitis, the condition common to knitters who enthusiastically cast on new projects left and right, but let them languish over time. I’m delighted to find the tide may be changing for me. This weekend I worked up an inexplicable head of steam and finished the project I’d been knitting, then eyed my overflowing basket of nearly-completed projects and popped the sleeves on a sweater that had been chilling since oh, 2012 or so. I recently found a truly satisfying needle for weaving in ends, so I dug around and found several other projects that only wanted for a few minutes’ finishing. I’ve got a bit of washing and blocking and photographing to do, but there are quite a few more finished projects on their way soon. I hope this bout of finish-itis is the first of many, or the start of a chronic trend.